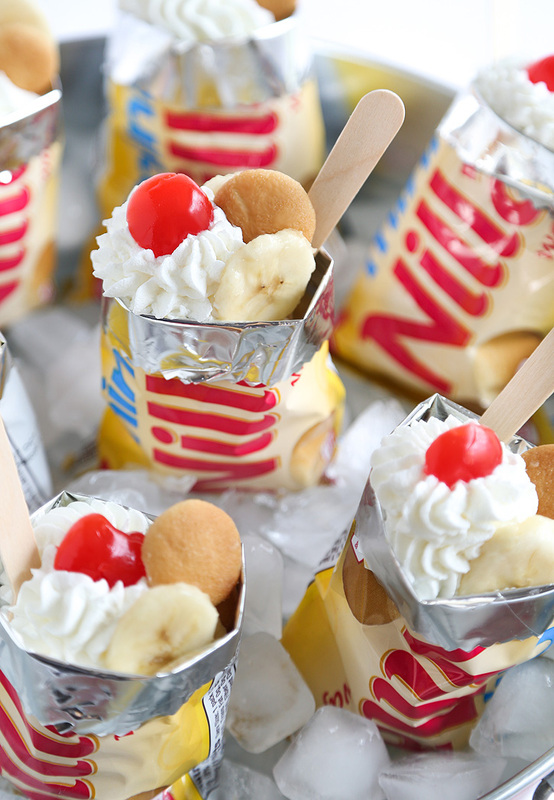 Totally Portable Banana Pudding in a Sack! Have you ever heard of walking tacos? They have all the ingredients you'd imagine a taco would have like ground beef, cheese, lettuce (et cetera) but instead of being layered in a taco shell they are stuffed in mini bags of Fritos. Their portability makes them perfect for camping, picnics, or just for eating in front of the TV. Well, this recipe is a lot like that except with banana pudding! This all started when I was in Target looking for anything but bags of mini Nilla Wafers. I wasn't sure what to make with them but I couldn't pass them up. 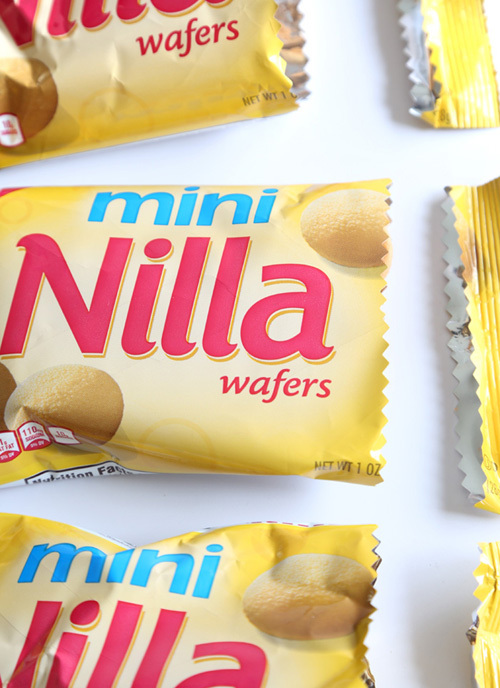 Nilla wafers are a pantry staple for me and they don't always make it into a recipe (if you know what I mean). Another important question - have you ever stuck your nose inside a freshly opened bag of Nilla wafers? If not, I recommend doing so ASAP. It's like inhaling vanilla birthday cake. 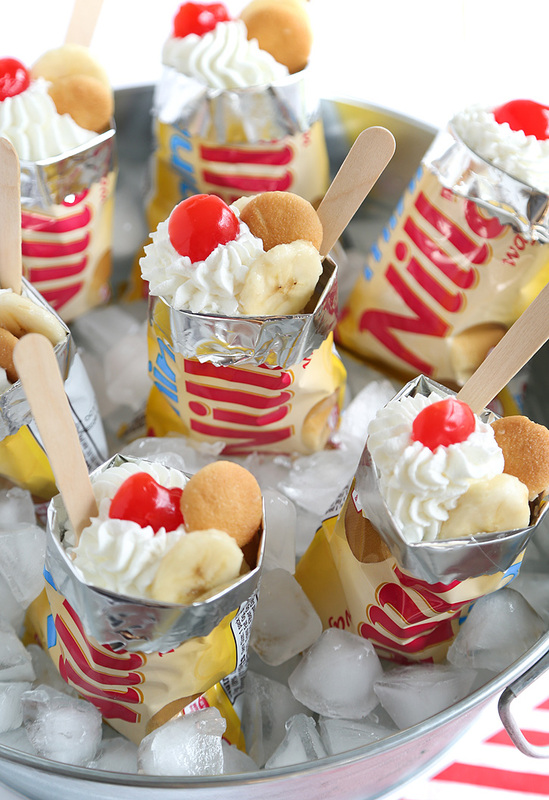 This recipe makes about 10 servings.You'll pour about half the contents of each Nilla Wafers bag in a bowl so you can layer the pudding and bananas easily. Give the bananas a quick toss in lemon juice so they don't brown. I assembled these in a tub filled with ice for easy serving, but you can stand them upright (leaning against each other) in a 13x9 pan. Here's the layering of ingredients in a nutshell: wafers, pudding, bananas, more wafers, pudding, bananas, whipped cream, cherry. The cherry is optional but it seriously increases the cute-factor because it matches the bright red "Nilla" on the front of the bag. After these are assembled you can serve them immediately but the wafers will be crunchy. 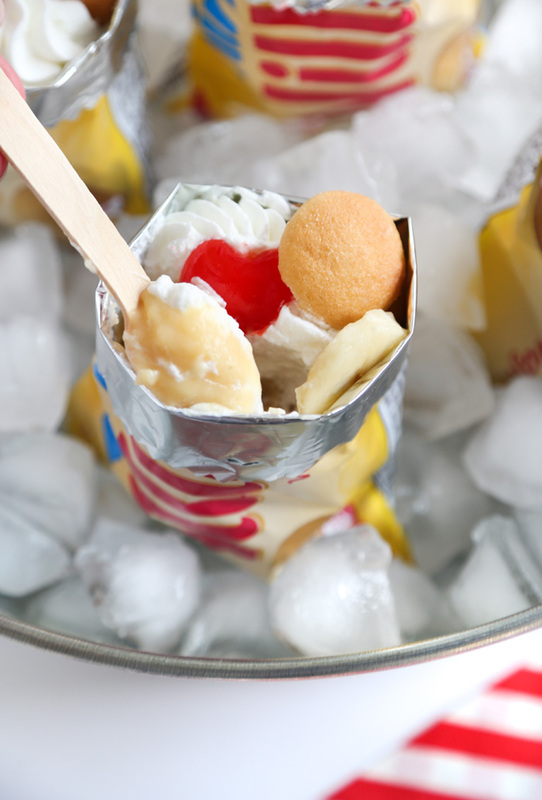 Instead, you can store them in the refrigerator for 1-2 hours so the wafers become soft like traditional banana pudding. Y'all. These are so much fun and talk about easy clean-up! Be sure to stick a disposable spoon in each bag before serving. I like birchware spoons which are biodegradable. 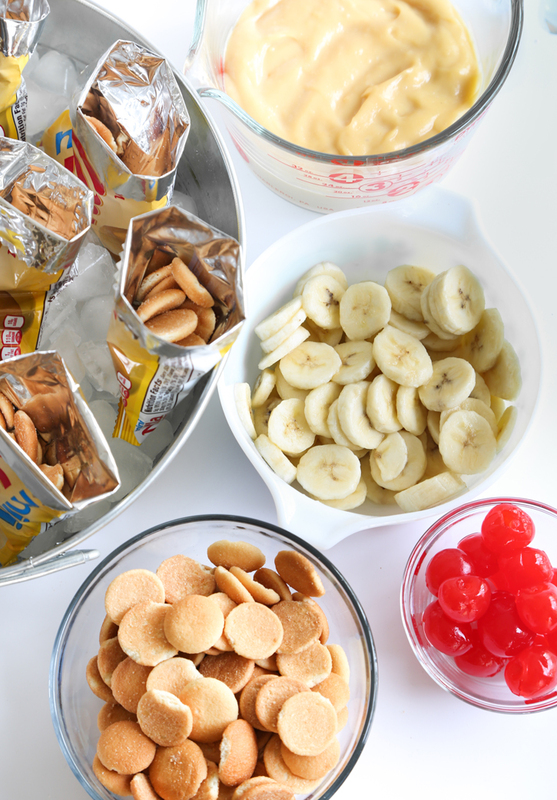 Open each snack pack and pour half the contents of each bag into a large bowl. Stand the bags upright in a baking dish leaning against each other. Place 1/2 cup sugar, cornstarch and milk into a medium saucepan and whisk until combined. Cook over medium-high heat until the mixture begins to bubble, whisking constantly. Remove the saucepan from the heat and gradually pour the eggs into the pan in a thin stream (tempering them) while whisking vigorously. Reduce the heat to medium and cook until thick and smooth, again whisking constantly. When the mixture is thick, remove from the heat and stir in the unsalted butter and vanilla. Stir constantly until the butter is melted and well-incorporated. Pour the pudding in a separate bowl and set aside to cool slightly. Chop the bananas into rounds and toss them in a bowl with the lemon juice until all of the bananas are covered. This will prevent them from browning. In the bowl of an electric mixer, beat the heavy cream on high speed until it starts to thicken. Gradually add in the remaining 2 tablespoons of granulated sugar. Beat until stiff peaks form. Transfer to a piping bag fitted with a fancy decorator tip, if desired. Otherwise just have a spoon ready for dolloping. Pour two rounded tablespoons of pudding over the wafers in each of the bags. Top with a few banana slices and more vanilla wafers. Layer one rounded tablespoon of pudding on top of the wafers, top with additional banana slices and wafers. Pipe or dollop whipped cream on top and garnish each bag with a maraschino cherry. Serve immediately or refrigerate for 1-2 hours so the wafers become soft. Place a disposable spoon in each bag before serving. Enjoy! These are great for picnics, slumber parties, game night in front of the TV – anytime you need to feed a crowd with very little clean-up. 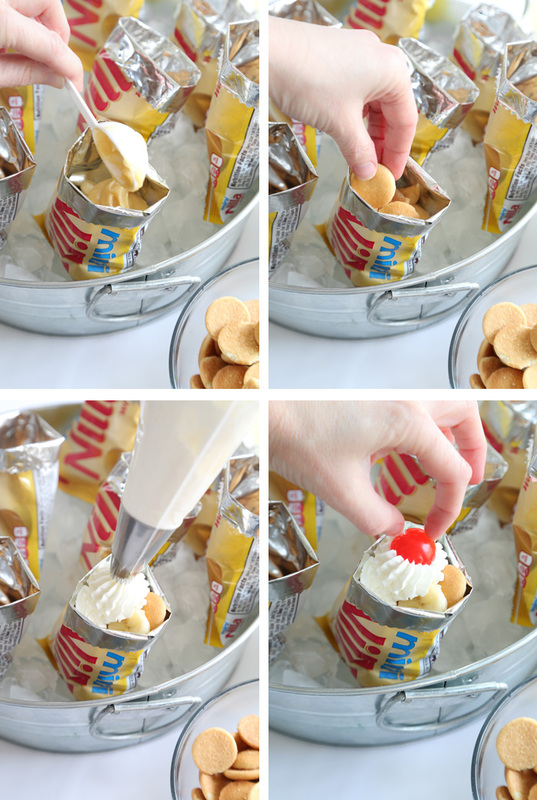 These are adorable and such a great idea for easy eating and easy clean up! I love these! They would be perfect for parties. Your a genius Heather! Que bela ideia. Ficou com ótimo aspecto. Ugh, your creations are sooooo amazing!!! Love your blog! I plan to make these for snack time in an after school program at my church. The kids are gonna love them! Mixtape Cookies for The Etsy Blog!